Every year, the University of Ottawa’s central administration claims to be facing financial difficulties. Despite this, year after year, the University ends its fiscal year with surpluses. In fact, over the last 9 years, the University has registered cumulative surpluses amounting to $347 million. The APUO analyzed the University of Ottawa audited financial statements of the last 10 years. These documents, which are prepared as per Canadian Accounting standards, paint a picture of the University’s true financial situation based on verified revenues and expenses, and facts. Audited financial statements provide a much more objective analysis of the university’s finances. You can view a presentation on the results of the analysis here. The Central administration claimed that the University ended the last fiscal year with a budgetary deficit of $5.1 million. It’s important to keep in mind that a budget is a future projection of planned revenues and spending, requires and receives no third-party oversight, and is built upon assumptions decided by the Central administration itself. A budget is nothing more than a document that articulates an organisation’s priorities, by demonstrating where they will allocate financial resources. The reality is that the University’s own audited financial statements indicate a $48.6 million surplus ($12.1 million excluding unrealized gains) for the 2016-2017 fiscal year. Following the analysis of the audited financial statements, the only reasonable conclusion we can make is that the University is in excellent financial shape. The Central administration is manufacturing a financial crisis. This serves as a pretext to hike tuition fees, impose cuts across campus, and give campus unions a difficult time during collective bargaining. If the central administration is truly concerned about its financial situation, there are alternatives to another austerity budget. The university could reduce capital acquisition expenses by slowing down the rate of construction, or shuffle some of the Internally Restricted Funds into the operational budget to keep it afloat (these subjects are explained in details in the presentation). If you wish to analyze the University of Ottawa’s financial statements, they are available here. To look at the University of Ottawa budgets, click here. The Association of Professors of the University of Ottawa (APUO) wishes to thank members of the Equity, Diversity and Inclusion Committee (EDIC), a joint committee comprised of APUO members and members appointed by the employer, for their work on equity and hiring practices at the University of Ottawa. In November, the committee updated the APUO and the Employer on the progress of their work for the 2016-2017 academic year. While their update highlights some key areas for improvement concerning gender representation and equity, the APUO is disappointed with the fact that the Employer refused to provide EDIC access to data to analyze the representation of visible minorities, aboriginal persons, and persons with disabilities. Unfortunately, the APUO is unsurprised by the gaps in the information provided to EDIC, and we suspect that this is an attempt to cover up campus inequities as it relates to the lack of diversity amongst professors. We urge the employer to make available to the EDIC the data about professors of visible minority groups, aboriginal professors, and professors with disabilities. It is crucial that this data be examined to identify gaps in equity and inclusivity on campus, and to find meaningful ways to address shortfalls in equitable representation amongst professors at the University of Ottawa. As the APUO prepares for the beginning of the next round of collective bargaining, we value the findings of the EDIC and look forward to identifying concrete solutions to address inequities with the employer. Below is a summary of the findings of the EDIC regarding gender equity as it relates to representation, pay, and time to promotion. As stated in section 17.1.6.3 of the Collective Agreement, a unit (department, faculty or school) is considered as having an under-representation of women, or an under-representation of men, if the proportion of one gender or the other is below 40%. In other words, for the purposes of the EDIC’s analysis, gender balance is considered to be achieved if the percentage of women full-time professors in a given department and faculty is between 40% and 60%. Here are some of the highlights in the EDIC’s findings regarding gender representation in each unit. Overall, the representation of women among full time professors in the Faculty of Arts is 44%. The representation of women is 25% in the Deparment of linguistics, 27% in the School of Music, 27% in the Department of Philosophy, 33% in the Département de Français, and 37% in the Department of Communication. Gender representation is balanced in the departments of English, Geography, History, Classics and Religious studies, Theatre, in the School of Translation and Interpretation, and in the Deparment of Modern Languages where the representation of women is 40%, 41%, 42%, 43%, 44%, 45%, and 50% respectively. There is an under-representation of men in the Department of Visual Arts, the School of Information Sciences, and the Institute of Official Languages and Bilingualism where 70%, 75% and 88% of professors are women. Women at the Telfer School of Management are under-represented making up 37% of full-time professors. In the Faculty of Education, gender representation is considered balanced, with 56% of professors being women. In the Faculty of Engineering, there is an under-representation of women who only make up 21% of full-time professors. Women represent 15% of full-time professors in the department of Civil Engineering, 18% in the department of Mechanical Engineering, 20% in the School of Electrical Engineering and Computer Science, and 38% in the department of Chemical and Biological Engineering. In the Faculty of Medicine, women are under-represented and make up 33% of full-time professors. Women are under-represented in the Department of Biochemistry, Microbiology, and Immunology, as well as the Depertment of Cellular and Molecular Medicine making up 24% and 25% of full-time professors respectively. The representation of women in the Department of Innovation in Medical Education and in the School of Epidemiology and Public Health is balanced at 50% and 58% respectively. There is an overall under-representation of men in the Faculty of Health Sciences with women making up 65% of full-time professors. In the School of Human Kinetics and the School of Nutrition Sciences, gender representation is balanced with women making up 44% and 60% of full-time faculty. In the Interdisciplinary school of Health Sciences, the School of Nursing, and the School of Rehabilitation Sciences, there is an under-representation of men, who only make up 36%, 21%, and 19% of full-time professors. There is a gender balance representation in the Faculty of Law, Common Law Section and Civil Law Section, with 54% and 52% of full-time professors being women. Overall, 45% of Full-Time professors in the Faculty of Social Sciences are women. There is an under-representation of women in the Department of Economics, the Graduate School of Public and International Affairs, the School of International Development and Global Studies, and the School of Political Studies, with women making up 24%, 31%, 32% and 36% respectively. The School of Social Work, the School of Sociological and Anthropological Studies, the School of Psychology, and the Department of Criminology have a balanced gender representation among professors at 43%, 52%, 52%, and 56%. In the Faculty of Science, women are under-represented, making up only 22% of all full-time professors. 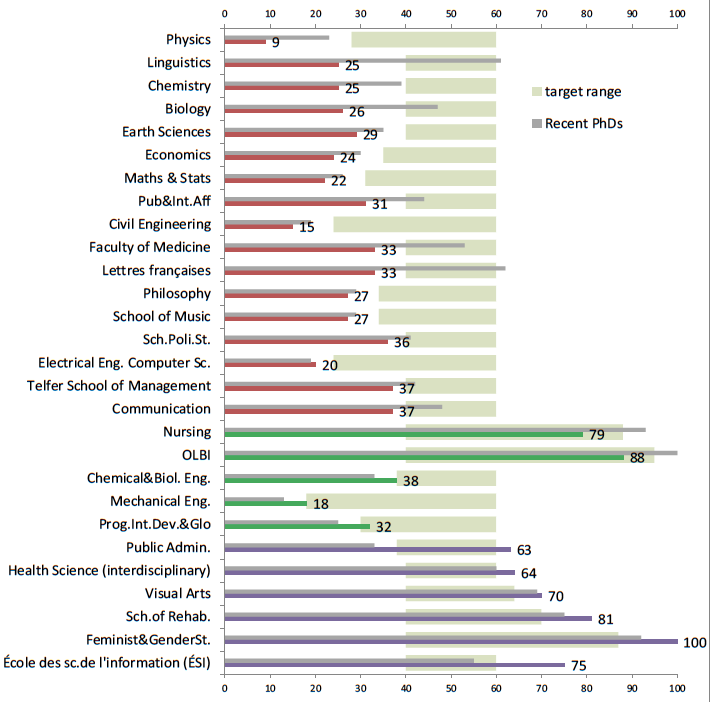 The Department of Physics has the lowest representation of women across the university at 9%. In the departments of Mathematics and Statistics, Chemistry and Biomolecular Sciences, Biology, and Earth and Environmental Sciences, women representation among full-time professors is at 22%, 25%, 26% and 29% respectively. 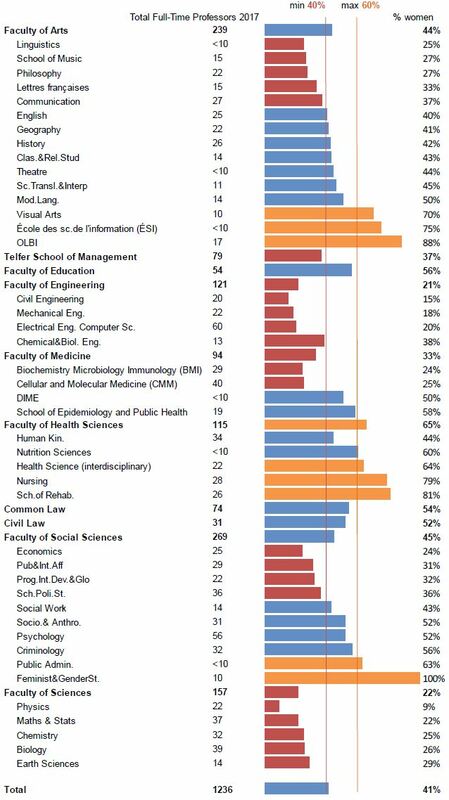 The following table was produced by the EDIC and lists all University of Ottawa units. Article 17.1.6.3 of the Collective Agreement also states that a department that hasn’t reached a gender balance should aim to have 5% points above the proportion of women or men, as the case may be, in the labour market. The proportion of women and men in the labour market is normally determined by the number of PhDs in the relevant discipline awarded by Canadian Universities in the last five years. For example, if 23% of recent PhD graduates in Canada are women, then the target range for women based on the market would be 28% through 60%. For programs or discipline where recent PhD graduates exceeds 60%, the target would be 5% below the labour market. For example, if 93% of recent PhD graduates in Nursing are women, then the target range for women would be 40-88%. Based on these criteria, the EDIC did a deeper analysis of gender representation within departments that don’t meet the 40 % threshold discussed above. The School of Nursing, the Official Languages and Bilingualism Institute, and the Department of Chemical and Biological Engineering, are within the target range in terms of gender representation in comparison to the labour market. The Interdisciplinary school of Health Sciences, the department of Visual Arts, the School of Rehabilitation Sciences, the Institute of Feminist and Gender Studies, and the School of Information Studies all continue to have an underrepresentation of men in comparison to the labour market. The following table was produced by the EDIC. According to the EDIC’s analysis, the salary gap has been decreasing across all ranks. However, we must remember that this progress doesn’t address the cumulative impact of the year-over-year gender gap when it comes to both salaries and pensions. The gender salary gap for Full Professors has decreased between 1995 and 2016 from -9.4% in favor of men to -2.3%. At the Associate Professor level, the gap decreased from -9.4% in favour of men in 1995 to -1.2% in 2016. The gender salary gap has only favoured women when there have been just as many or more women in a given department. When looking at the average time to promotion between men and women from Assistant professor to Associate rank the gap narrowed on average from 1 year and 10 months in 2001 to 11 months in 2004. When looking at the difference in time to promotion between men and women from Associate to Full professor rank, the EDIC notes a significant difference in the Faculty of Education, where women can wait 9 years and 7 months longer than men for their promotion. In the Faculty of Medicine, women have been promoted from Associate to Full professor rank 6 years later than men. On the other hand, in the Faculty of Science, women have been promoted from Associate to Full professor rank 3 years and 6 months earlier than men.